Crystal River Cruises officially welcomed Crystal Mahler to its award-winning fleet yesterday in Germany during a handover ceremony held at MV WERFTEN Shipyard. The second “Rhine Class” river ship was received by Crystal’s newly appointed president and CEO, Tom Wolber, and was then christened by godmother Laruen Barfield. Ms Barfield is an American volleyball star who has led teams to victory since her professional career began in Europe in 2012, and is currently playing for reigning German champions SSC Palmberg Schwerin, a team sponsored by MV WERFTEN. Ms Barfield christened the ship with the traditional German blessing and champagne bottle breaking, as Crystal executives, local dignitaries and guests from Crystal parent company, Genting Hong Kong, looked on. Crystal Mahler joins Crystal Mozart and sister “Rhine Class” ship Crystal Bach, which embarked just last month, as part of the Crystal River Cruises fleet that was recently named “World’s Best River Cruise Line” by the readers of Travel + Leisure. Sailing seven-, eleven- and 16-day voyages along the Rhine and Danube Rivers, she will visit Austria, Germany, Slovakia, Netherlands and Hungary. Two additional “Rhine Class” ships, Crystal Debussy and Crystal Ravel, will join the fleet in 2018. 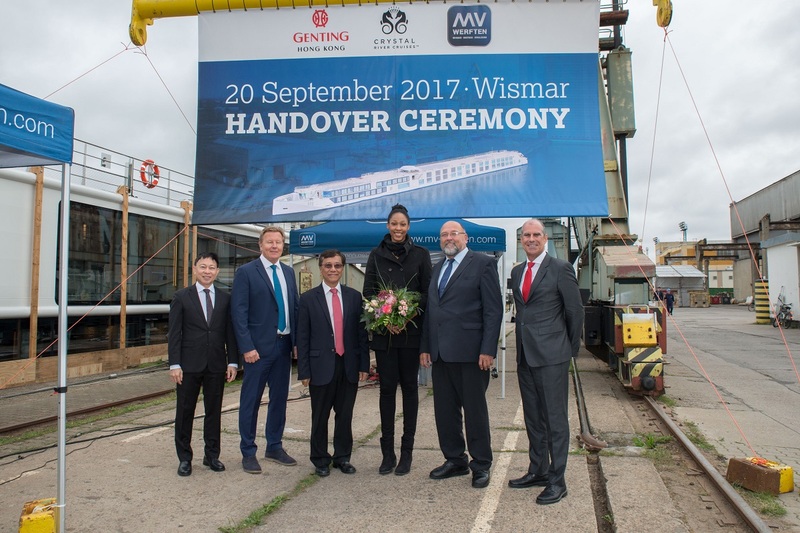 “A new milestone has been reached with the handing over of Crystal Mahler to Crystal River Cruises as half of the Rhine Class river cruisers have now been delivered,” said Jarmo Laakso, CEO of MV WERFTEN, during the handover. The four 106 all-suite, all-balcony “Rhine Class” river ships will offer gorgeous amenities and spaces rarely seen in river cruising, featuring Crystal’s signature service thanks to the highest crew-to-guest ratio in the industry. The ship features French balconies in all suites, many with walk-in closets and dual vanities in the bathrooms, and Crystal’s celebrated butler service in every suite to attend to guests’ individual wishes. ETRO robes and slippers, personal iPads, wall-mounted 42-inch, flat-screen HD TVs with streaming movies, complimentary Wi-Fi, and Nespresso machines are standard in every suite. Additional enticing features include a spa treatment room and separate fitness centre and Crystal’s farm-to-table, Michelin-inspired cuisine in multiple, open-seating eateries including the elegant Waterside Restaurant, namesake Bistro café, the exclusive Vintage Room and the Palm Court.